I invested in this extremely rare strand when I came across it a few years ago in a small rock shop. How unique is it? Let's just say I had never seen it before and have not seen another since! 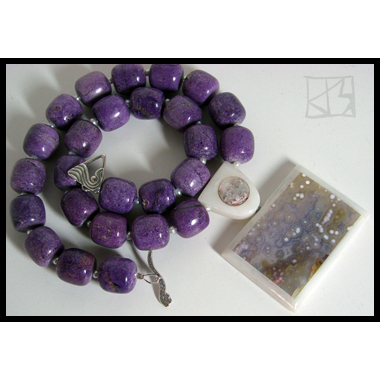 The mineral is called Lavenderite, and rockhounds call it Purpurite due to its natural, untreated color. 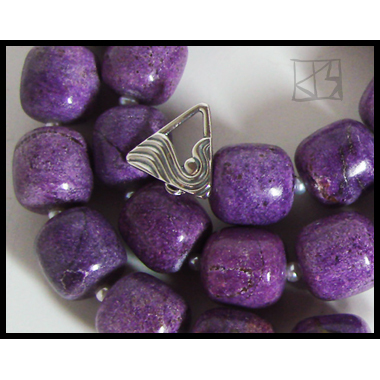 True shades of violet are especially uncommon in nature, and this stone, these beads, are impossibly p-u-r-p-l-e, about 99% pure. There are a few pockets around the globe in which lavenderite occurs; this is from Namibia, the place rockhounds agree the best specimens come from. And these beads are BIG, too (14mm x 13mm). The shop owner had one small boulder from which three strand (two were chips) and a handful of cabs were cut. I knew I had to have them and then I waited until I had the perfect centerpiece to do them justice without stealing their glory... and here it is! 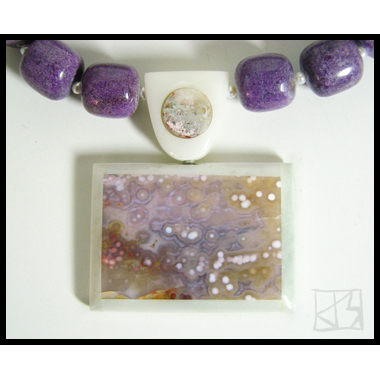 This gorgeous intarsia pendant is expertly crafted from pure white jade inlaid with a stunning rectangular cabochon of orby ocean jasper. There's a second round cab embedded in the bail as well. This colorful stone is from the island of Madagascar, home to some of the yummiest stones on the planet. The best ocean jasper is found there, and this piece is an exemplary specimen with fabulous hues of lavender, greens, grays, pinks and whites. Tiny white freshwater pearls separate the larger beads and the necklace is finished with a beautiful curling ocean wave sterling silver toggle clasp that completes the modern geometric symmetry. I see this piece as both artsy and elegant... what will wearing this piece express about YOU?